NEWSFLASH!! A new BUG FIX update for Remindfulness (2.1.1) IS NOW AVAILABLE. This makes the app work with iOS 9! Also, we have screens for iPhone 6 and 6Plus. Remindfulness Recovery Edition is next to get the overhaul. Stay tuned! Q. Why have the reminders stopped coming? It's a limit built into apple's iOS that only 64 notifications can be sent before your device causes the app to stop sending them. Sadly, there is no workaround. Q. Help! The reminders sometimes vanish before I can read them! 1) Adjust your iphone or ipad's Notification Settings to "Alert Style" alerts (instead of the device's default "Banner Style") CLICK HERE to see what it looks like. 2) Check in the device's Pull-down Notification Center to find and open the latest reminder. THIS VIDEO shows how. Q. Is there a way I can save a particular reminder to read again later? Reminders stay in the device's Pull-down Notification Center (see VIDEO) until you delete them or until they are replaced by incoming reminders. To save a reminder permanently, you can share it with yourself in email or SMS by clicking the VIEW button on the notification. This will take you to where the reminder is displayed inside the app, on the Reminder Screen (the one with the crystals). The SHARE button will give you options. You can also select and copy the text of the reminder and paste it into any app that will accept the PASTE function, including Notes. Q. Why is the app not working properly? 1) Double click the device's Home Button to open the active icon tray along the bottom and slide them over until you find Remindfulness. iOS 7 - swipe up and away to delete the Remindfulness screen showing above the icon. 3) Single click the device's Home Button to return you to the main device Home Screen. 4) Locate, press and hold the Remindfulness app button until it wriggles and a black "x" appears. Tap this. 5) Answer "Yes" when it asks if you really want to uninstall Remindfulness. 6) Power off your phone using the button on the top of your phone, holding it down until the red slider appears. 7) Wait 5 minutes, then power on by tapping the same top of phone button. 8) Make sure you have a Wi-Fi or very strong 3G connection and re-download Remindfulness from the iTunes/App Store. 9) When it has installed, tap the icon to open. 10) Now adjust the device's Settings>Notifications>Remindfulness for "1 recent alert" and "Alert Style" notifications. 11) Test. It should work fine. If not, please contact support HERE. Q. Can I read all the reminders at once? Nope. 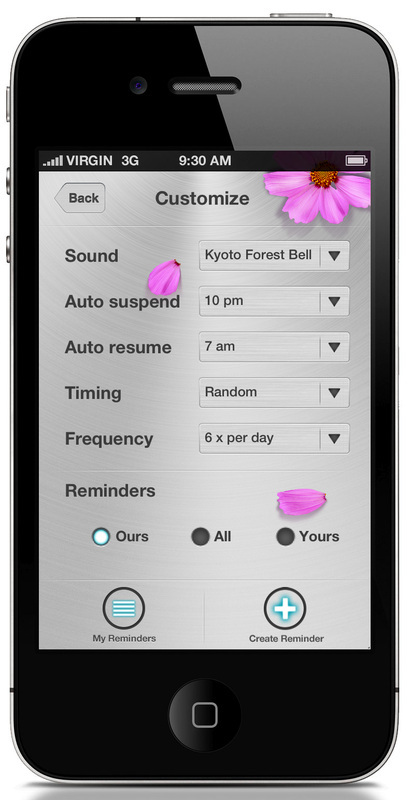 Sorry :-) You can only read your own custom reminders by accessing the list on the bottom left of the Customize screen. The Remindfulness reminders can only be read when they come up. This is to give each practice the most impact. Q. Why aren't the custom reminders I made coming up? The reminders come up randomly so the more you add, the more often yours will appear amongst the messages that come with the app. If you only want to see your own reminders, select the "Yours" button on the Customize screen.